How long have you been playing the shakuhachi? Please sponsor Shakuhachi Festival Scholarship, so those less fortunate can join in. Write down the sum you contribute. Are you a member of the European Shakuhachi Society (ESS)? Do you wish to pay your ESS membership fee (20 Euro) during the Festival registration? Would you like to travel around Czech republic after the Festival ends with other people from the Festival? Please upload a photo showing your face, it will be displayed on your festival pass. The size of the photo must not exceed 2 megabytes. Please note, that when paying via PayPal service, the price is a little bit higher due to PayPal fees. European Shakuhachi Festival will offer courses on Japanese traditional instruments, shakuhachi, koto and shamisen. All courses will last four days full-time and will include entrance to all concerts and lectures of the festival. One of our goals is to introduce shakuhachi, koto and shamisen to European musicians. Therefore, we have significantly reduced prices for introductory courses. Course application for download here. We try to keep fees for the courses as low as possible. If you still find the prices to be way above your budget, please contact us. Many fellow players are willing to contribute more than they need to pay solely out of their good will and solidarity. In past years, thanks to this, we were able to partially or completely reduce fees for several students who wouldn't be able to attend otherwise. Such acts of solidarity create a sense of community. A sense that we seek to maintain throughout all the events we organise in Prague. This course will be lead by a shakuhachi master and will provide participants with instruction on tone production and basic techniques. Students will also learn some simple tunes and simple versions of honkyoku pieces. Participants do not need to own their own shakuhachi for this course. It will be possible for them to either borrow or buy shakuhachi Yuu (made from molded plastic) at the festival venue. Furthermore, participants of the course will be given the opportunity to buy excellent book, Shakuhachi: Manual for Learning, by Christopher Blasdel at a discount price. This course will provide its participants with expert and thorough instruction on a wide selection of pieces. The festival's main guests will form the core of the instructors. Zenpo Shimura will teach koten honkyoku of the meian style - Choshi, Kyorei and Takiotoshi. He will be aided by Kiku Day who will help with interpreting into English. Shinzan Yamamoto will teach modern pieces of the Tozan School. Christopher Yohmei Blasdel will teach Kinko honkyoku - Hi Fu Mi Hachi Gaeshi. Together with Gunnar Jinmei Linder he will also lead the sankyoku class. Koto players Haruko Watanabe and Kikuko Sato will also join this class, so the students will be able to play the sankyoku along with koto or shamisen. Jim Franklin will teach three pieces - Takiochi, passed onto him by Yokoyama Katsuya, Tehodoki Reibo (Chikuho School) and his own composition Salz. And finally, Vlastislav Matoušek will teach his own avant-garde composistion Inside the Circle. Each teacher will select two pieces from his repertoire. There will be a wide range of difficulty to ensure that players of all levels will be satisfied. Furthermore, outside of regular classes, teachers will give individual lessons. This will enable any student to discuss and go through the pieces that were taught in the class individually. The individual lessons will be organised on "first come, first serve" basis. However, we guarantee each participant an individual lesson with one of the teachers. * Reduced price is for the members of European Shakuhachi Society. We encourage you to become a member of this society since its one year membership costs only 20 euro. This course will be lead by koto masters Haruko Watanabe and Kikuko Sato and will provide participants with instruction on basic techniques and understanding of scores. Participants will learn Japanese simple tunes. We have a couple of kotos and one shamisen available for the participants. Therefore, number of places is very limited if you don't own the instrument. Please reserve long time in advance. This course will be lead by a professional koto and shamisen player, Kikuko Sato. Kikuko studied the Ikuta School and will teach intermediate and advanced pieces of its repertoire. Participants are required to bring their own instruments. We expect very few people to attend this course. Chances are, therefore, the course will be organised on individual basis which is a unique opportunity for everyone who wishes to attend. All courses will take place in suitable, well-equiped rooms of the Czech Academy of Music (HAMU). Read more about the venue here. Pieces which will be taught will be announced in the upcoming weeks. Their notation will be made available to the participants in advance via the internet. Regarding other costs of your stay in Prague, please see the page dedicated to accommodation. Food and drinks are very affordable in Prague. A regular lunch in a restaurant costs five to six euro including a drink. Buying food in a grocery shop will of course reduce the price further. Price of a large beer, depending on the venue, is between one and two euro. European Shakuhachi Festival nabízí kurzy na japonské tradiční nástroje shakuhachi, koto a shamisen. Všechny kurzy budou trvat čtyři dny (27-30/08 2010) a zahrnují vstup na všechny koncerty a přednášky festivalu. Jedním z našich cílů je představit shakuhachi, koto a shamisen evropským hudebníkům. Z toho důvodu jsme výrazně snížili cenu kurzů pro úplné začátečníky. Snažíme se udržet ceny kurzů co nejnižší. Pokud však stále shledáváte cenu kurzů neúnosnou, kontaktujte nás. Čistě z jejich dobré vůle a solidarity je mnoho hráčů je ochotno přispět více než musí. Díky tomu se nám v minulých letech podařilo poskytnout částečné nebo úplné slevy několika hráčů, kteří by se jinak nemohli zúčastnit. Tyto a podobné projevy solidarity vytvářejí komunitní duch, který se snažíme udržovat na všech akcích, které v Praze organizujeme. Tento kurz povede mistr hry na shakuhachi a poskytne účastníkům instrukce týkající se produkce tónu a základních technik. Studenti se také naučí několik japonských lidových písniček a zjednodušených verzí skladeb z repertoáru honkyoku. Účastníci tohot kurzu nepotřebují svůj vlastní nástroj, neboť jim bude umožněno zapůjčit si nebo si zakoupit shakuhachi Yuu (z litého plastu) v místě konání festivalu. Budete-li chtít této služby využít zmiňte tak prosím ve vaší přihlášce. Navíc, účastníci tohoto kurzu si budou moci zakoupit vynikající knihu Christophera Yohmei Blasdela Shakuhachi: Manual for Learning za sníženou cenu. Tento kurz poskytne svým účastníkům expertní a důkladnou instruktáž pro celou šíři skladeb. Hlavní hosté festivalu tvoří jádro instruktorů tohoto kurzu. Zenpo Shimura bude vyučovat koten honkyoku. Hráčka na shakuhachi Kiku Day mu bude asistovat a pomůže s tlumočením do angličtiny. Shinzan Yamamoto bude vyučovat skladby školy Tozan. Christopher Yohmei Blasdel bude vyučovat Kinko honkyoku. Dále také povede hodiny sankyoku společně s Gunnarem Jinmei Linderem. Těchto hodin se také budou účastnit hráčky na koto Haruko Watanabe a Kikuko Sato, studenti tedy budou moci hrát sankyoku za doprovodu koto nabo shamisenu. Jim Franklin bude vyučovat skladby předané mu Yokoyamou Katsuyou. A na závěr, Vlastislav Matoušek bude vyučovat své vlastní soudobé kompozice. Tento kurz povedou mistryně hry na koto Haruko Watanabe a Kikuko Sato, které studenty seznámí s nástroji a povedou je k zvládnutí základních technik a čtení not. Účastníci se v rámci kurzu nauč známé japonské melodie. Pro zájemce máme k dispozici několik koto a jeden shamisen. Z toho důvodu je počet účástníků kurzu velmi omezen, pokud ovšem nevlatníte vlatní nástroj. Prosíme rezervujte si své místo dlouho dopředu. Tento kurz povede japonská prefesionální hráčka na koto Kikuko Sato. Kikuko studovala při škole Ikuta a bude vyučovat středně pokročilé a pokročilé skladby repertoáru této školy. Účastníci si potřebují přinést vlastní nástroj. Očekáváme, že se tohoto kurzu zúčastní velice málo lidí. Proto je pravděpodobné, že kurz bude organizován na individuální bázi, což jedinečná příležitost pro každého, kdo by si přál se kurzu zúčastnit. Všechny kurzy se budou odehrávat ve vhodných a dobře vybavených prostorech Hudební a taneční fakulty AMU (HAMU). O místě konání si přečtěte více zde. Konkrétní skladby, které se budou vyučovat, budou oznámeny v následujících týdnech. 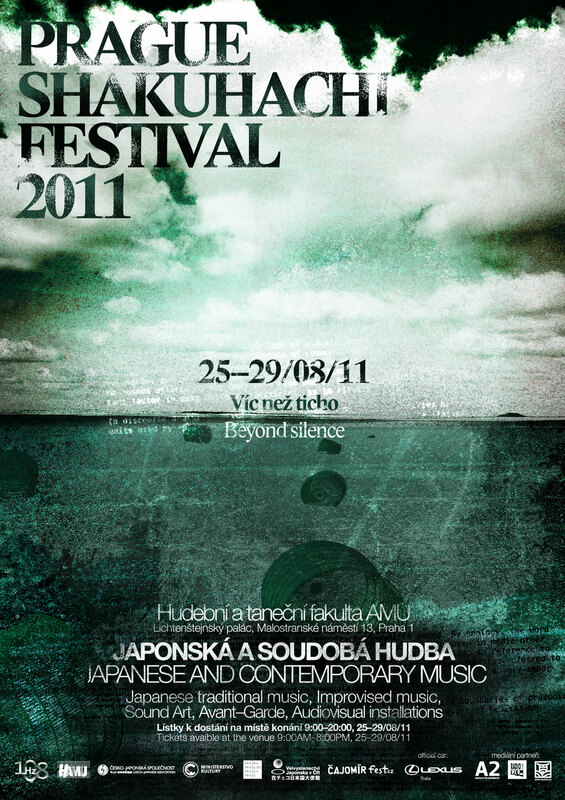 Photos from the Prague Shakuhachi Festival 2012 can be found in the gallery. Vlastislav Matoušek will perform on shakuhachi flute in Prague's botanic garden on 12th of May. More info here. International music festival in caves. Vlastislav Matoušek will perform in Chynovska cave on 21. 4. 2012. More info on his site. New PSF 2011 photos in the gallery. You can view and download the poster in high resolution here.